A must for every sauna! This sauna sealant is imported by Northern Lights Cedar Products, a world leader in cedar products for the outdoor lifestyles. This sealant is safe for all types of sauna including cedar, pine, hemlock and redwood. The non toxic water based sealant is used to protect the wood from the damaging environment inside a sauna. Sweat contains salt and acids that can quickly destroy the wood. High humidity and temperature can quickly break down wood fibers. 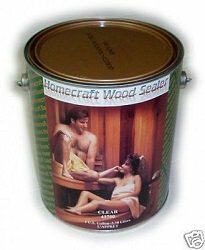 This sauna sealant is specifically designed for interior of saunas and will protect and preserver the beautiful wood. The sealant is water based and will not leave any residue or offensive odor. . The sauna sealant keep helps keep the original color from fading or bleeding. Its clear tint keeps the original color.